The third wishlist service that we will include in our wishlist comparison table is the wish list service named Lahjalista.net. It is a dedicated wish list service that has been around since 2006 and was last updated 2 years ago. Let's see what they have. Starting the review with security and privacy again. Brief testing shows that the site does not have 3rd party ads. One point from that. The site shows (not so good) suggestions in a very central position. Perhaps getting partners/affiliates was their business idea that never materialized. Anyway, now there is no sign of affiliate cookies, so we can give a check mark for that. 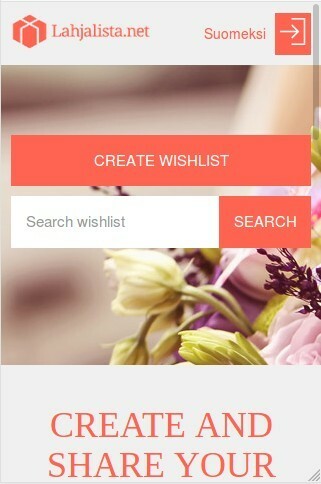 In this service, wish list creation is started by clicking the 'create wishlist' button on the front page. Then you give your list a unique id. This is a nice idea, but not very practical in real life as the 'good' names are already taken. Now it makes me try something only to find that it was already taken. So just giving a name to your list may be a challenge. Be prepared to try a few times or pick something more complex that others haven't used yet to begin with. The next step is to assign the list a password, or skip password creation. The password is actually useless, as the link to the list is not published anywhere in the service. In theory, unprotected lists could be accessed through the front page search functionality, but the user would need know the exact name of the list to do that, as e.g. my search term 'mai' didn't bring up my test list 'maija2'. 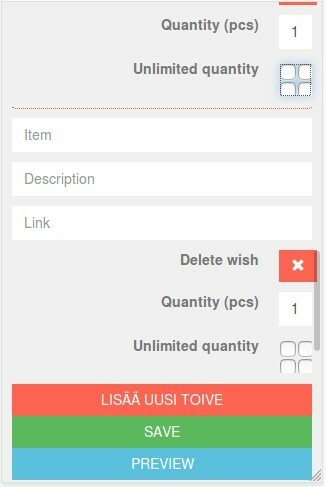 Next, the user will need to give the wishlist a title and an optional description, add wishes, and finally click 'save'. Saving opens a pop-up that asks the user for their own email address and their login password. The email address needs to be in a valid format, but it is not otherwise verified. If you accidentally give a wrong address, you will be in trouble. After closing the pop-up, you can click the 'preview' button and then 'share' button to see the url to your list. It is up to the user to share the list's url and password as they please. This qualifies in our review as offering a private and public list. A check mark for that. This service is a dedicated wishlist service, as that is all the service does. A check mark for that. There is no mobile app, but the pages will scale to a mobile device, so one mark for a modern GUI. Wishes can be added from anywhere, which is great. Again one check mark. The service does not offer a bookmarklet, so everything needs to be typed in manually. No check mark for that. The site is provided in English and Finnish, so we can count it as a multilanguage service. One check mark for that. However, at the time of making this review, there were several places where an English translation was not provided and only Finnish strings were present. Login to the service is done with an email and password combination. That is also the only provided login method. No check mark for multiple login methods. The service can track purchases, but at the time of making the reservation, an invitee needs to provide a valid email address. This might be a bit inconvenient and insecure, but still works as a way of making a personal reservation. This will also allow the service to send email to the person who has reserved an item for managing the purchase, in case they want to modify or cancel their reservation. A check mark for tracking purchases. That was the functionality of the lahjalista.net service. There is no 'surprise me' functionality, nor any support for group purchases. No check marks for those, but one for the modern scaling GUI anyway. There isn't any extra functionality beyond those we have already covered. We might list the suggestions as a extra functionality. However, the suggestions are neither related to the list nor to the event (for example, I created a test list that was for the 2nd birthday of a toddler, and the service proposed a Moccamaster coffee machine), and actually it seems that there are only a total of three different suggestions. So, maybe it's not worth mentioning. What you think? After clicking through the site, I noticed a link from the front page to the old version of the service. There is more information about the service, like FAQ, Terms of service and a link to their blog (last update from March 2016). Links to ToS and FAQ are not visible if the English language has been selected.